Information taken from: The Sideroads of Parry Sound & Area,﻿ Family Business Soars Quietly Over Three Generations, Summer 2008 edition, Pages 20-23. Written by Darlene Wroe . 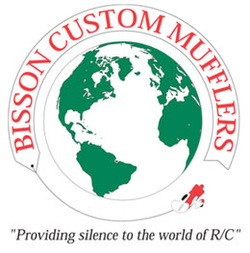 Bisson Custom Mufflers, which is currently located in the Township of McKellar has been in business since the 1970's. The company got its start in Toronto in 1953 when George Bisson decided to teach his son Jim to fly model air planes. George was unhappy with the noise the planes made so he decided to make a better muffler . George started selling these mufflers to other model air plane enthusiasts and a few small hobby shops before he and his wife Irean decided to officially created Bisson Custom Mufflers as a part time business. The business started to build up to selling to hobby shops not just in Ontario but in Alberta and the Maritime Provinces as well. In 1987 George and Irean decided to move out west leaving the business to their son Jim. In 1990 Jim and his wife Sue decided to retire, taking the business with them as they moved to McKellar. In 1992 Jim went to the Toledo show to promote Bisson Custom Mufflers and from there the business really took off. In 1995 Jim asked his oldest son Lance to join the business . Lance had an engineering background and brought with him knowledge regarding sheet medal which created more opportunities to make different mufflers. In 2001 Jim's youngest son James joined the company and then Lances wife and Sue's cousin. Today they have over 200 costom mufflers to choose from and there market is world wide selling to countries such as Russia, Singapore, Denmark, Poland and Czechoslovakia.